The Nairobi city small group, walking tour covers the modern city center the colorful Nairobi city market, parliament buildings, Kenyatta International Conference Centre; the landmark of Nairobi (KICC), The 7th memorial park bomblast, the Nairobi railway station museum , National archive and general view of the city. Discover the highlights of Nairobi from a local perspective. 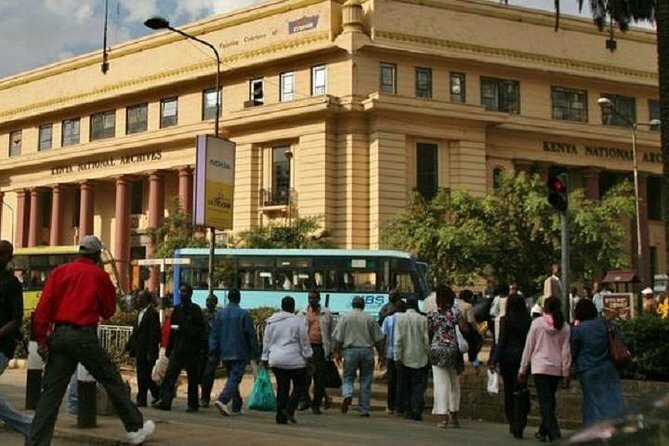 Take a walking tour and experience the unique atmosphere of Nairobi’s bustling city center. Enjoy breathtaking views from the KICC tower – an impressive 28-story skyscraper. Visit top Nairobi attractions such as Mzee Jomo Kenyatta Mausoleum and Kenya National Archives. Learn about the first stock market and the “Thorn Tree”- the first post office at Sarova Stanley hotel Shop local crafts at City Market or Maasai Market and let your guide help you bargain Get insights about the tribes of Kenya from your guide. Learn about the city’s culture and history. If you wish, finish the tour with a coffee at one of the many coffee houses. The tour can be customized according to your interests and schedule. Always ask your guide for help. You will visit a local market where you can bargain and shop for arts and crafts. You will later walk back to your city hotel with your guide.